Raspberries are in season, just begging us to make use of their sunny, jammy flavors. Moreover, I just purchased a new bottle of Cachaça, because every once in a while I get that Caipirinha itch. Let’s see if we can play matchmaker with those. Cachaça is mostly produced in Brazil, where 390 million gallons are consumed annually, compared with 4 million gallons outside the country. I don’t know about you, but I am doing my part to beat the Brazilians and put the US on the map for Cachaça consumption. USA! USA! USA! And of course, the Caipirinha is the national cocktail of Brazil, but to be honest, I find the combo of lime, sugar, and (essentially) very funky rum to be a little one-note and boring, so I like to add in one other fruit, which varies according to my mood. Unfortunately, such a drink is technically called a Capifruta, but sometimes the technically correct is also the hopelessly ugly, and “Capifruta” sounds really grating to my American ears, whereas Caipirinha does not. Unlike economics or physics, this is an instance where judicious use of language can actually shape reality, so I will refrain from calling this drink by its “correct” name. I never add more than one fruit besides lime, because we’re making a mixed drink, not a big bowl of mashed up fruit. Sometimes I use kumquats, and then I omit the lime altogether. Place raspberries and limes in a mixing glass and muddle thoroughly. Shake over ice and then pour the entire contents of the shaker into an old-fashioned glass. The smashed up lime wedges are the garnish. The process I described here is the traditional way, as far as I know, and it is the one I followed for this photograph, but I did not enjoy the little pieces of ice floating on top of the drink, and I don’t think anyone else would, either, so I suggest finely straining this over fresh cracked ice and then garnishing it with a fresh lime wedge. It won’t quite have the rustic feeling if you do it that way, but it will produce a more polished drinking experience. Rough up the garnish limes a little if you really need to. Much like the old fashioned, you could use caster sugar instead of simple syrup, and the granules of sugar would macerate the lime peel a little more effectively than simple muddling, releasing more lime oil. As with the old fashioned, I will mention that the ROI on this procedure is very small, but you can do it if you feel exceptionally fancy. You will really want to use caster sugar, though, so as to avoid undissolved sugar granules in the final drink, which you will agree is much worse than slightly less lime oil. Categories: classics | Tags: booze, brazil, cachaca, caipirinha, cocktail, cocktails, drinking, drinks, lime, mixed drink, muddle, raspberry, rum, summer drinks | Permalink. 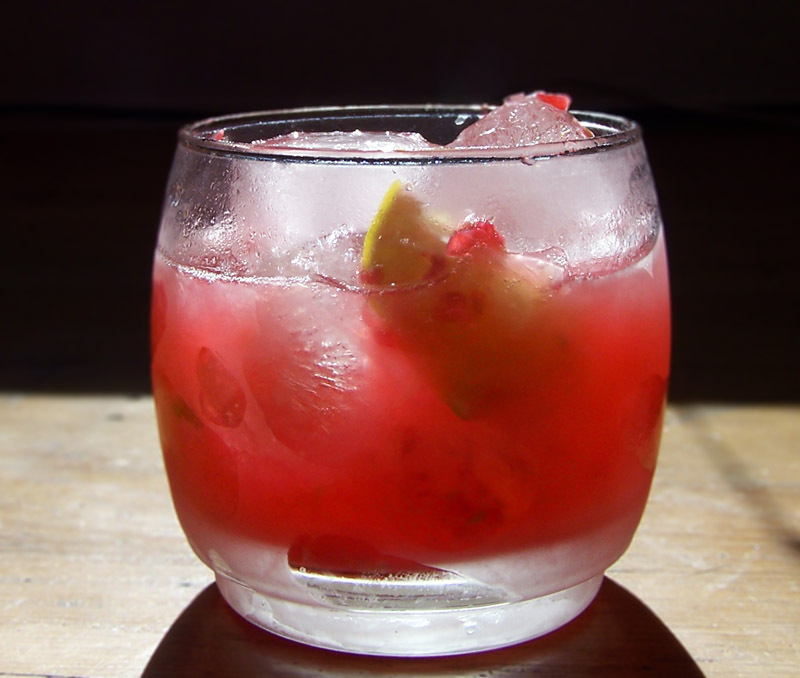 I love Raspberry Caipirinhas, but use a raspberry-infused cachaca. I have not tried muddling fresh raspberries into it, but imagine it would be delicious as well! I actually really like a basic caipirina too, though. That raspberry cachaca turned a righteous color. I’m looking forward to hearing about your ROB rum.